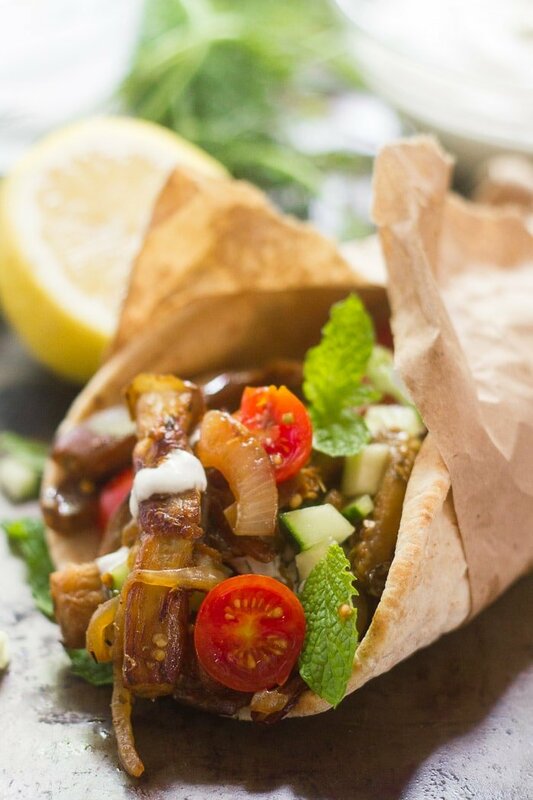 These vegan eggplant gyros are made with savory pan-fried strips of seasoned eggplant, wrapped up in warm pita bread with creamy dairy-free tzatziki. Every now and then I have to post a vegetarian version of a meat-based dish that I’ve never actually tasted. It’s a bit of a conundrum. See, part of why I know what I’m doing when it comes to vegetarian cooking is because I’ve been cooking vegetarian meals for a long time. But the reason I’ve been doing it so long is because I gave up meat at a pretty young age. So, lots of the dishes I’d like to make-over are dishes I’ve never in fact tried. 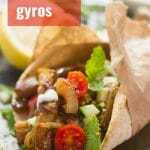 Take gyros for example. I know some parents who are pretty good at getting their kids to eat stuff that might be considered a little exotic, but lamb just wasn’t happening on my dinner plate when I was a kid. So I never tried a gyro. I’ve gone out for Greek food and been served sandwiches with names like “veggie pita.” That, along with some Googling, is about as much as I know about what gyros taste like. Setting authenticity aside, you should probably make these, for a few reasons. First, they were delicious. They tasted, to me, what I always imagined a gyro would taste like, you know, except for the lamb part. They do have all of the seasonings you’d normally find in a gyro. Second, despite having never tasted a gyro, I apparently nailed it. My husband (who has had an authentic gyro) confirmed that what I created was, in fact, a gyro, only better, because it was made with eggplant. I’ve had tzatziki sauce, so I can say with confidence that if you’re missing dairy tzatziki, this will do the trick for you. In fact, I think I like my vegan tzatziki better than the conventional version. That’s saying a lot. This stuff is super creamy and packed with garlic and dill flavor. With it slathered all over my eggplant and veggies, I felt like I could no longer claim not to know what a gyro tastes like! Do I need to salt my eggplant? Only if it’s been hanging around for a few days and/or shows browning when you cut it open. In this case, salting will remove any bitterness that may have developed. If you do find that you need to salt your eggplant, just place the strips in a colander and sprinkle them liberally with salt. Let them sit for about 30 minutes, then rinse well and pat try. Why does this recipe use so much oil? Eggplant soaks up oil like crazy when it cooks! You may try to cut back on it, but do so at your own risk and make sure you’ve got a good nonstick cooking surface. Can this recipe be made gluten-free? 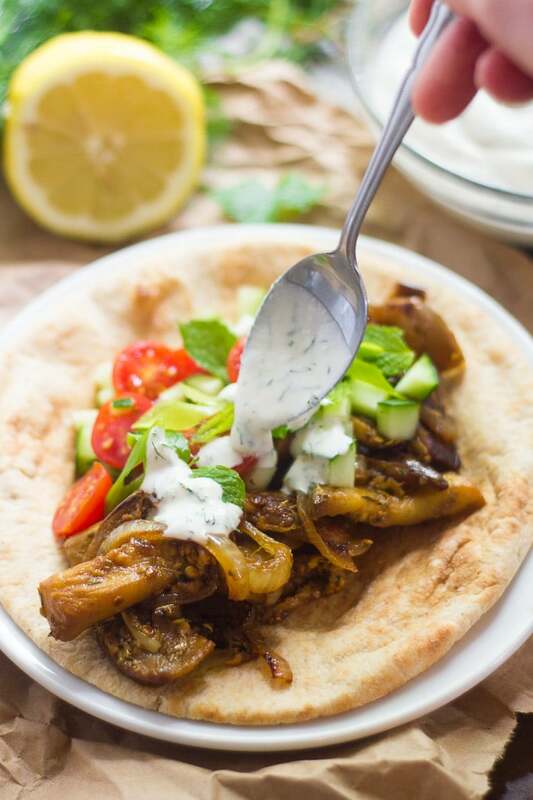 It can, if you can find gluten-free pita bread and use gluten-free tamari in place of soy sauce. Place the cashews, milk, lemon juice, and garlic into a bleder or food processor and blend until smooth. Thin with additional milk until the desired consistency is reached. Add the dill and salt. Pulse to blend. Taste test and add more salt if you like. Stir the lemon juice, soy sauce, thyme, oregano, cumin, paprika, and black pepper together in a small bowl. Generously coat the bottom of a large skillet with oil and place it over medium heat. When the oil is hot, add the eggplant. Cook for about 4 minutes, flip and cook 4 minutes more, until the strips are tender and beginning to brown. Raise the heat to medium-high and add the onion. Cook about 3-4 minutes more, until the eggplant and onions have some nice dark spots. 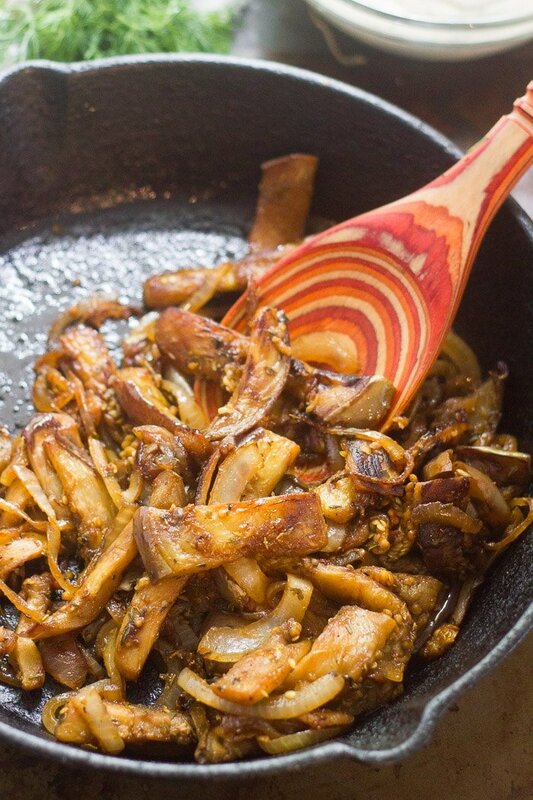 Pour the soy sauce mixture into the skillet and flip everything a few times to incorporate. Allow to cook until most of the liquid has cooked off, about 4 minutes more. Remove from heat. Divide eggplant among pitas and top with cucumber, tomatoes, scallions, mint, and tzatziki. Serve. Recipe and photos updated on July 17, 2017. I think this version is better, but if you're looking for the original, email me at alissa@connoisseurusveg.com. If your eggplant is any larger than 1 pound (assuming you're doubling the recipe or only using part of a larger eggplant), or has a significant amount of seeds, consider salting it before marinading. This will draw out any excess bitterness that the seeds develop as they age. You will likely have more tzatziki than you need. It should keep in the fridge for a few days. You can also seal it up and freeze it, or use it for another batch of these later in the week, or as a salad dressing. This sounds pretty tasty! I will have to give this one a try soon. Congrats on your marriage! Your husband is a lucky man, getting to taste test all this good stuff. I’ve never had a gyro either, so I’ll try yours and just call it authentic. I think that’s the best thing to do! I totally agree with you. I have no problem with my gyro experience being limited to the eggplant variety! I love eggplant! This looks delicious! I’ve never had lamb and I never plan on eating it either! I had a friend tell me lamb tastes like blood, No thank you!! 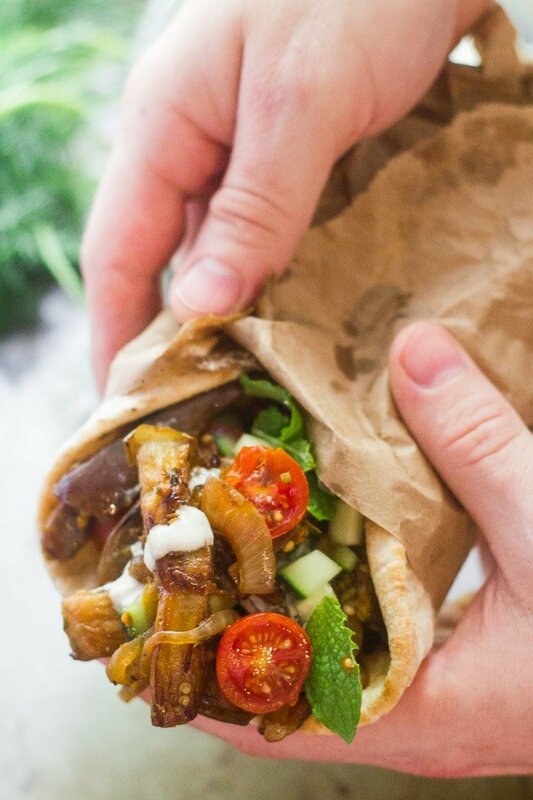 hmmm… hadn’t even thought about eggplant as the meat substitute for a gyro! brilliant. And your Tzatziki sauce looks super interesting as well. With my wife pushing for more vegan meals AND our CSA delivering eggplant, I might have to try this. Thank you! Eggplant is one of my favorite swaps for meat these days. :) I hope you enjoy them!! 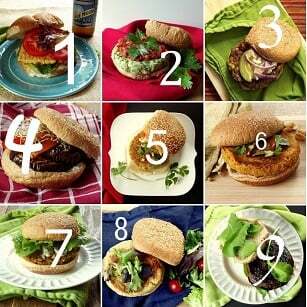 Thanks for this easy and delicious recipe Alissa. Some recipes over power the flavor of the eggplant but not this one, the eggplant really bursts thru. A local vendor was sampling tzatziki that she makes and I ended up buying that since I’m not vegan. I will try your cashew version another time. Thanks so much Marry! I’m glad you enjoyed these!! This was so outstanding that I was licking my fingers! I took a picture but don’t know how to post it here in the comments. Incredibly delicious!!!! That is awesome! I’m glad you enjoyed them! Thanks so much Erin!! These are AMAZING!! Thank you for the recipe! I cut the tzatziki recipe in half and was plenty to go with the amount of filling generated from one medium to large sized eggplant. It was finger licking, juicy deliciousness. I’m so glad you enjoyed them! !